Brussels Sprouts Carbonara – This dish combines a few of my favorite things, caramelized shredded brussels sprouts, pasta and pancetta in a delicious, creamy sauce that takes about 15 minutes to make. A few of my favorite super quick pasta dishes are Pasta with Roasted Broccoli with Garlic and Oil, Angel Hair Pasta with Zucchini and Tomatoes, Fettuccini with Winter Greens and a Poached Egg. I made this yesterday for lunch and Karina, my oldest daughter loved it. 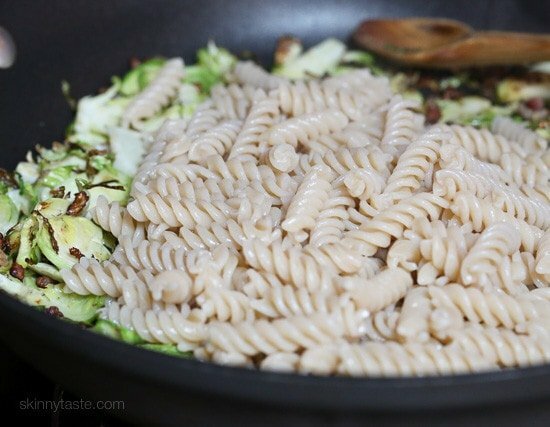 I didn’t want to use white pasta, but I didn’t think whole wheat pasta would be right here so I used a my favorite gluten-free fusilli from DeLallo which has the same taste as white pasta, with a perfect al dente texture. If you can’t find it near you, you can order it here. You can also, of course use any pasta you wish. This recipe serves six, but you can easily halve it to serve 3 if you don’t want to make as much. Hope you enjoy! If you make this recipe, take a picture and share on Instagram with a hashtag #skinnytaste for a chance to get a regram! Pin It To Save This Recipe! Whisk eggs, 1/2 cup of the cheese, basil and crushed red pepper if using; set aside. In a large deep nonstick skillet, saute pancetta and shallots about 3 minutes, add the garlic and saute another minute. 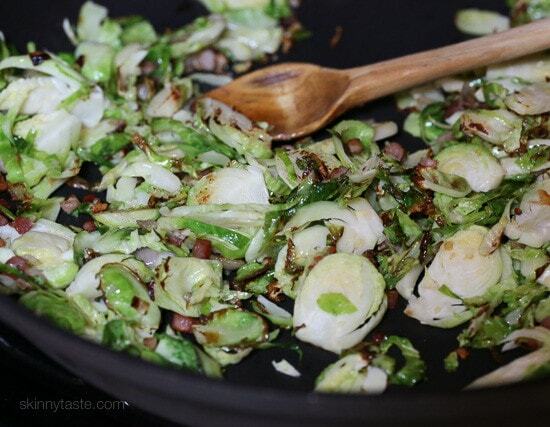 Add the shredded brussels sprouts, and black pepper and saute another 8 -10 minutes, until slightly caramelized. Remove from heat. Meanwhile cook pasta al dente according to package directions. Reserve 1 cup of the pasta water just before draining, then drain and add to the skillet and mix well with brussels sprouts. Slowly, a tablespoon at a time, add 1/4 cup of the water to the egg mixture and mix well, slowly add to pasta stirring well, add additional reserved pasta water 1/4 cup at a time as needed, stirring and finish with the remaining 1/4 cup cheese. Serve right away. 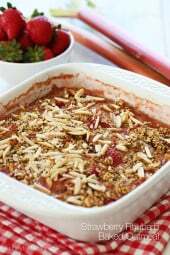 I absolutely love this recipe but now I’m pregnant and can’t consume raw egg. Do you think it’ll be fine if I just omit the egg altogether? Is there an alternative? I know that’s a silly question since this is carbonara but I’d love to still make this! Thanks! I don’t know of any alternatives for this unfortunately. I made this last week and I am making it again for company tonight. It is so simple and easy to make but taste great! I recommend you add the crushed red peppers! I made this last night, and the texture seemed almost mushy and gummy. I used GF pasta so I’m not sure if that has to do with it. Do you have any suggestions of what I could do different? Or what may have caused the gumminess? Any idea how many freestyle points this might be? Thanks! If you substitute the pancetta for turkey bacon, what would the total smart points be for the meal? Thank you!! Sorry, I don’t have that handy! I’ve made this recipe a few different times. My biggest problem with it is that it doesn’t end up being very low cal for me since I can’t stop at one serving. It is so yummy! I think that the most I’ve managed to squeeze out of this is 4 servings. Obsessed with this right now. I made this for supper last night, and both my husband and I thought it was quite good. He thought it needed to be “saucier”, so I added some more pasta water to the leftovers, and also sprinkled some slivered almonds on top for a little crunch. I love a little heat, and appreciated the crushed red peppers. Made this tonight and it was fantastic! Used pre-shredded Brussels Sprouts which saved some time after a long day at work. Thanks again Gina for another great recipe! 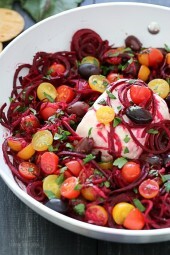 This is so yummy, it's part of our "heavy rotation" for dinner. Can't wait for the SP values! Love this dish. So delicious! Will definitely be making it again. One of our favorites. Very good. If you don't have pancetta, you can sub ham or bacon. I've had to do that on occasion. – Used finely chopped broccoli instead of brussel sprouts which I would only recommend if you like broccoli since broccoli tends to have a bit more flavor than other veggies. – Added the egg mixture into the saute + water with the heat still on – I was a bit concerned about the eggs being raw so I let it all simmer for a bit, until it got thick. 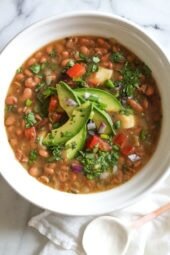 Overall, the recipe is awesome, even with my small changes! I made this tonight. It is incredible! Delicious recipe! I don't eat pork, so I substituted mushrooms. Yum! It's like a grown-up (way more delicious) hamburger helper! I absolutely love it. I added chicken, and can't wait for leftovers tomorrow! i just poured out my pasta water:(…can I use tap water? I will definitely try this again but omit the red pepper flakes, I don't feel it was needed. 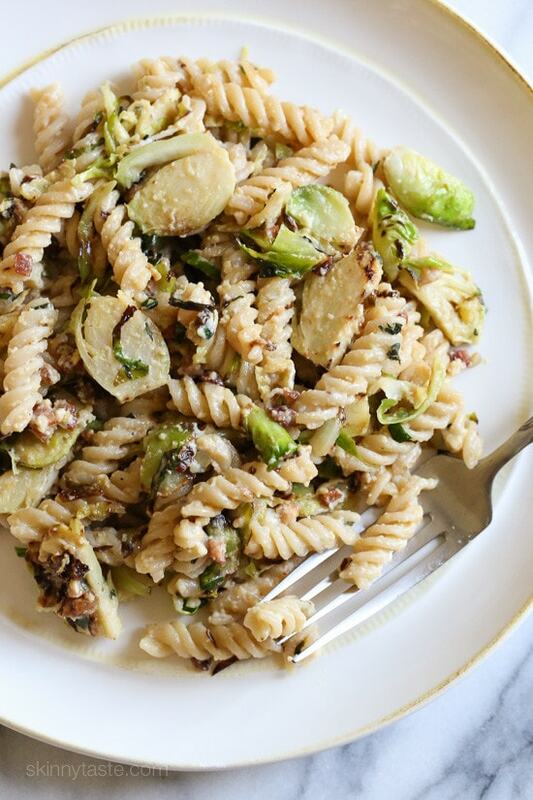 This is a very filling dish, especially with the pasta and brussel sprouts. Can you substitute zucchini for Brussels sprouts? Love this! I tried it yesterday but sadly my supermarket had no sprouts. i used ordinary mushrooms instead and it was simply fabulous! will definetly try again when they stock up on sprouts again but i know it will be great. thank you for this great recipe! Made this for dinner tonight and my 2-year old asked for seconds! So good. Made this for dinner last night and the family loved it! Was looking for a pasta recipe without red sauce and this hit the spot. Love your recipes – thanks! This might be a silly question but do I need to worry about the raw egg going in? Since the mixture is off the heat I'm worried about it not getting cooked… Thanks!! I kind of worry about that too – particularly for leftovers. So, I made this last night. It was delicious!! And my concerns about the egg went right out the window. It's so diluted and then once its mixed with the pasta and Brussels sprouts I don't think there's any reason to worry. Oh My God : Perfect Guide for a Great Carbonara ( I Wait the Moment of Lunch… ). Congratulations , ByeBye & Lots of Love !!! This is probably a stupid question, but I have a big bag of frozen Brussels sprouts. Can I just de-thaw them and use them for this recipe? It looks awesome!! Sure, but fresh would probably taste better. Yay!! More Brussels sprouts recipes!!! I can't wait to try this one! Trim stem off and cute in half. Lay flat side down and use a knife to shred them thin. Looks great!! Any advice on a good substitute for pancetta to make this vegetarian? Leave it out and saute in olive oil. How much olive oil? 1 TBS enough? Mabye try some mushrooms. Diced portobellos would be a good 'meaty' substitute, or even baby bellas to give the brussels sprouts some balance with the pasta. Looks amazing — been waiting for a recipe like this — but 9 points! wow — I hate to "waste" that many — I guess it's a main dish, but still – ouch. I may have to make it without the pasta. 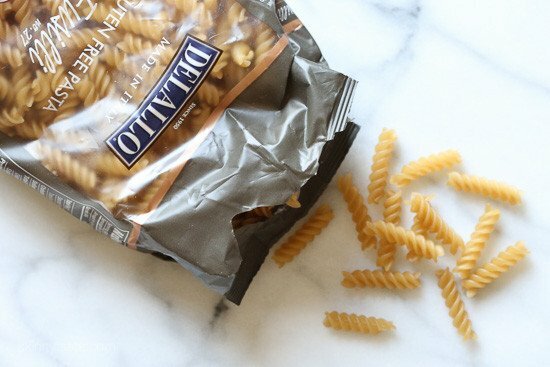 Have you tried Creamette Quick Cook in 3 minutes pasta? It's 5 points for 3/4 cup dry pasta. It makes quite a large serving. Try it! You'll be glad you spent the points. Just budget for it throughout the day. Totally doable! Would using 'egg whites only' be an option? Or one whole egg + one egg white? You really need the whole egg for the carbonara. The traditional Italian recipe only uses the yolks. 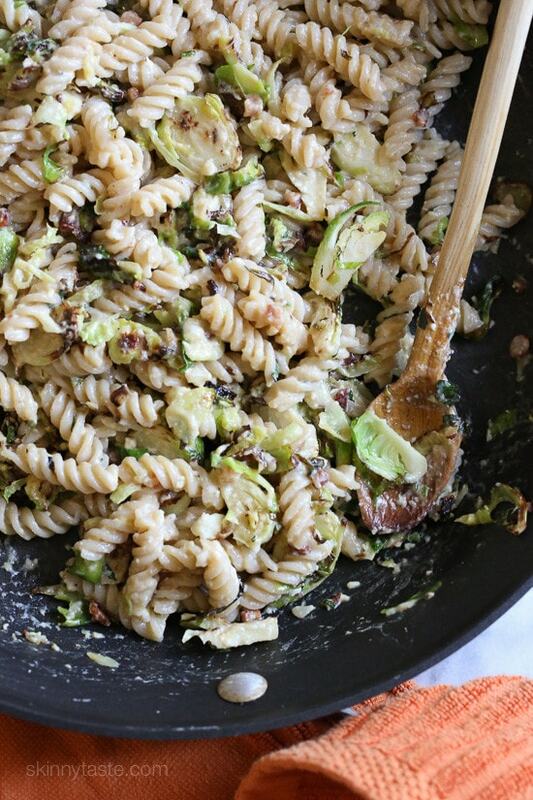 Do you have any suggestions for brussel sprout substitutes?! Any other veggies that would work well? Thanks!! Could you use spaghetti squash instead of pasta? Do you know how that would change the points? Thanks for the great recipes!!! Any idea how many WW points this would be without the pancetta? It sounds delicious as is, but I don't eat meat. 8 points, but you would have to add about 1 tbsp of oil. Looks fabulous! Wondering if any other vegetable would also work here besides brussel sprouts? I make this with asparagus too! This looks delicious! I love cooking with shredded brussels sprouts. Can you provide an estimate of about how 10 oz. 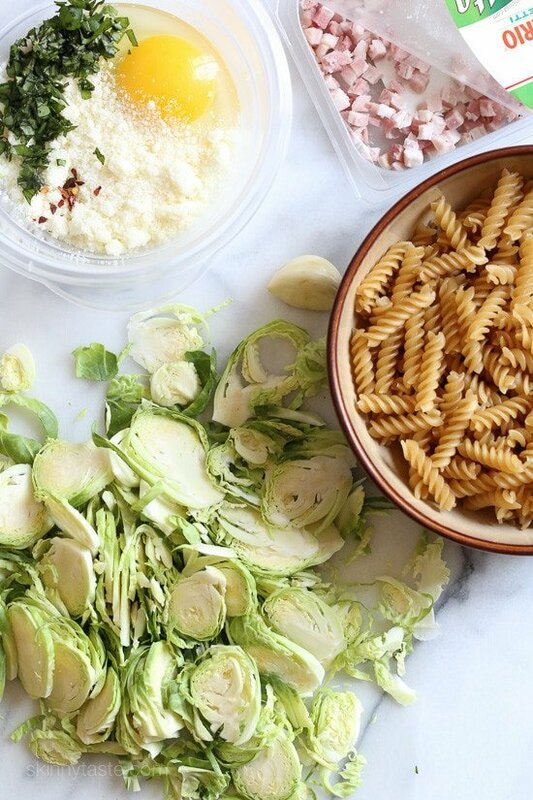 of shredded sprouts measures up in volume – like maybe 2 cups? Thanks for another great recipe! I'm not sure, it was a whole package of sprouts if that helps! 2 cups might be right, but I'd be guessing. Wow, finally a recipe that will help me cook brussels sprout that my kids are also going to love! Looks very delicious, i will make it at home soon.